Belgium’s Jean-Michel SAIVE beat the hometown hero, Jörgen PERSSON, to win the ITTF-Legends Tour tournament in the Swedish city of Halmstad. At the final hurdle, Jean-Michel SAIVE emerged victorious in four games (11–8, 4–11, 11–9, 11–7). Both present at the recent GAC Group 2015 ITTF World Tour Qatar Open in Doha, arguably gave the two finalists the edge over their illustrious rivals. Nevertheless, for both their path to the gold medal contest was by no means without moments when the eventual decision was in some doubt. At the quarter-final stage Jörgen PERSSON accounted for Germany’s Jörg ROSSKOPF in four games (12–10, 11–9, 9–11, 11–3) and thus repeated the success he enjoyed when they last met on the international scene. They confronted each other at the LIEBHERR 2004 World Team Championships in Doha when Jörgen PERSSON had also emerged victorious. Jörgen PERSSON overcame Frenchman Jean-Philippe Gatien, again in a four games duel (11–9, 10–12, 11–6, 11–6), to reserve his place in the final. Meanwhile, in the opposite half of the draw, at the semi-final stage Jean-Michel SAIVE overcame Sweden’s Jan-Ove WALDNER (11–6, 13–15, 11–8, 12–10), to reverse one memorable decision and repeat another. 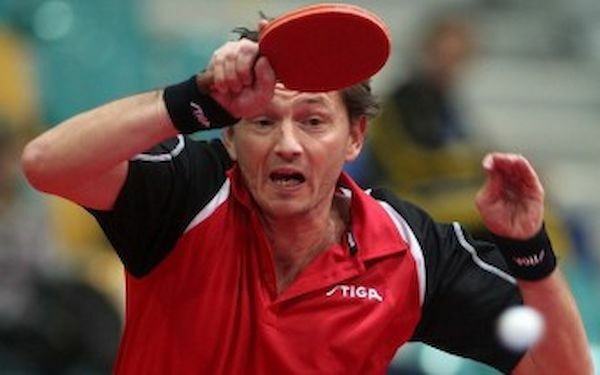 In the inaugural ITTF Legends Tour tournament staged in Jemeppe-sur-Meuse, last May, Jan-Ove WALDNER had beaten Jean-Michel SAIVE in the final; however 20 years earlier Jean-Michel SAIVE had enjoyed what may be considered his greatest hour. He beat Jan-Ove Waldner in Birmingham’s Indoor Arena in central England, to be anointed European champion. Simply the character of Jean-Michel Saive is underlined, he enjoys the battle, he enjoys the heat of competition. Will he ever change? I hope not. The win recorded by Jean-Michel SAIVE turned back the clock; it was same one round earlier when Jan-Ove WALDNER played China’s Jiang Jialiang. Furthermore, he made a promise. “Next time I’ll win!” he concluded. A success, the estimated attendance approached the 2,000 spectator mark.